Gernikako Arbola (the tree of Gernika in Basque) is an oak tree that symbolizes traditional freedoms for the Biscayan people, and by extension for the Basque people as a whole. 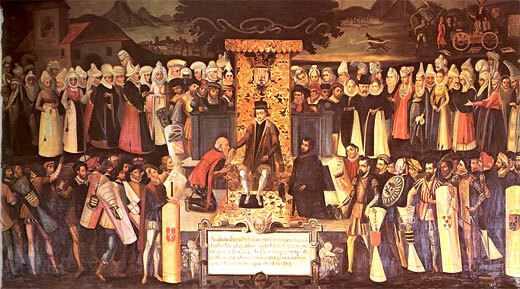 The Lords of Biscay (including the early kings of Castile and Carlist pretenders to the throne) swore to respect the Biscayan liberties under it, and the modern Lehendakari of the Basque Country swears his charge there. The tree of Gernika (Guernica in Spanish) is one of the sacred trees under whose shade the custom developed--and continues--that representatives assembled. The significance seems to have pagan or pre-Christian origins. These trees have a history representing various deities whose names appear on gravestones such as in Aquitaine Arixo deo ("God Roble"); Arteche deo ("God oak"). While there are several revered oak trees (e.g., the Malato in Luiando, tree Krutzia, the Sobrarbe, the Aretxabalagañe that of Abellaneda, Gerediaga oak of Durango, etc. ), it is the one in the Basque town of Gernika that has gained wider significance as the modern symbol of Basque freedoms. The known specimens or generations of the tree of Gernika form a dynasty. The "father," was planted in the 14th century, and lasted 450 years. 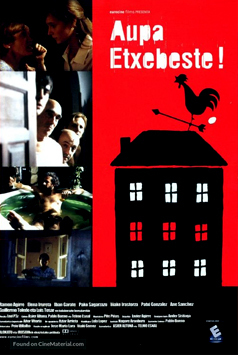 This coincided with Basque self-government in this area under the Basque fueros or foral laws. As symbolic tree of traditional freedoms, no Biscayan, for example, could be arrested for crimes without prior notice to him. 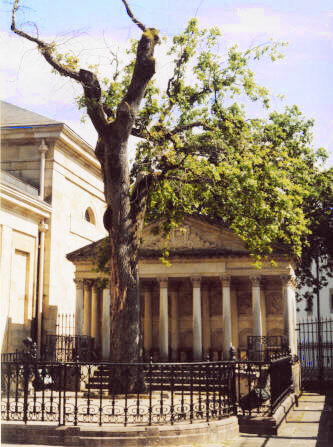 The ancient oak of Guernica, says Laborde in his account of Biscay, is a most venerable natural monument. Ferdinand and Isabella, in the year 1476, after hearing mass in the nearby church of Santa Maria de la Antigua, repaired to this tree, under which they swore to the Biscayans to maintain their "fueros" (privileges). The tree of Gernika came to the attention of the noted English poet William Woodsworth, who in 1810 had published his sonnet "The Oak of Gernika:"
For various reasons, the oak of Gernika would go on to become the most famous of these sacred oaks. In the middle ages, the representatives of the villages of Biscay would hold assemblies under local big trees. 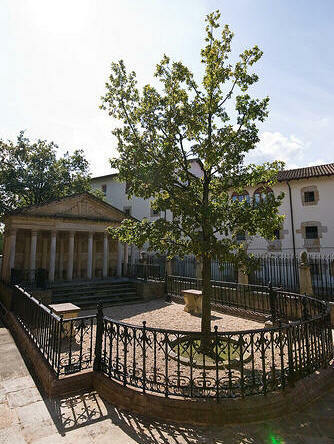 As time passed, the role of separate assemblies was superseded by the Gernika one in 1512, and its oak would acquire a symbolic meaning, with actual assemblies being held (the current building is from 1833). Notice of the Tree of Gernika grew in scope. The noted English poet William Wordsworth published a tribute in 1810 that spoke of it's "holier power." The Castilian poet Tirso de Molina wrote how the tree symbolized the rejection of tyrants. But it is arguably the Basque bard Jose Mari Iparragirre's (image at left of a painting in front of the sacred oak) song "Gernikako Arbola" that transformed the tree into a symbol for all Basques. 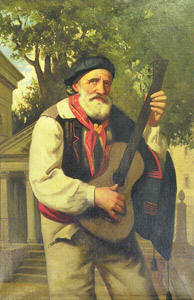 He first sang the song in Madrid in 1853. 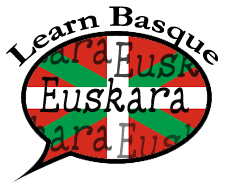 Though it has many verses, it is the well known first stanza that has become the defacto Basque national anthem; the seven historical provinces have never been unified in modern times. 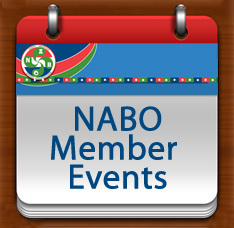 At many a Basque-American festival it follows the singing of the American national anthem. the fruit unto the world. The "father" was planted in the 14th century, and it lasted 450 years. Then its seedlings have been planted over the years. The "old tree" (1742-1892), re-planted in 1811. The trunk now is held in a temple in the surrounding garden. The third (1858-2004), re-planted in 1860, survived the bombing of Gernika in 1937 but had to be replaced because of a fungus. The gardeners of the Biscayan government keep several spare trees grown from the tree acorns. Some of these seedlings have made their way around the world to various Basque clubhouses (see below). The current one (from 1986) was replanted on the site of its father on the 25th of February 2005. Behind the structure is another seedling--in case something happens to the other. 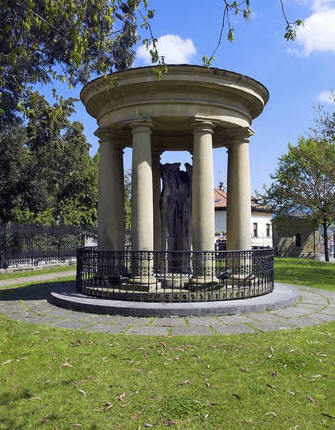 The restoration of Basque autonomous self-government in 1979 maintained the tradition started with the first Lehendakari Jose Antonio AGUIRRE Lecube back in 1936, of inaugurating the Lehendakari at the Tree of Gernika. The penultimate Lehendakari, Patxi Lopez Alvarez and the current Lehendakari Iñigo Urkulluwere also inaugurated in Gernika. The Tree of Gernika's Seedlings are around the world; below is a recently planted seedling in front of the Basque clubhouse in Chino, California.